WILMINGTON, Del. 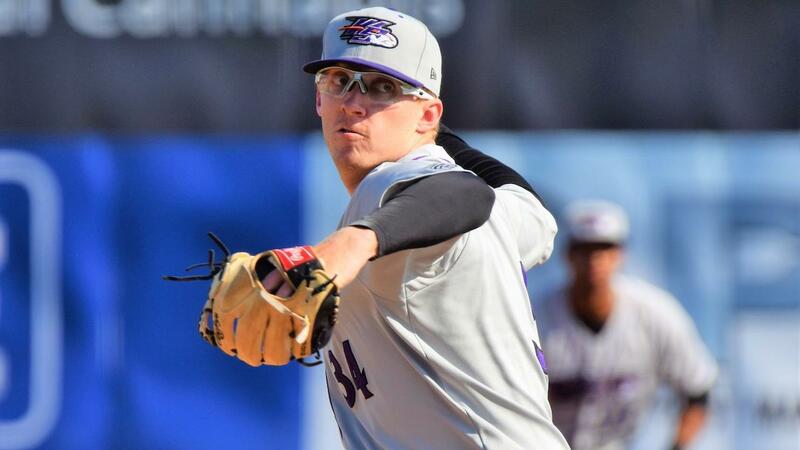 (April 10, 2019) - Despite limiting Wilmington to just three hits, the Dash fell to the Blue Rocks 4-1 in the series finale as Wilmington clinched a three-game sweep at Frawley Stadium. The Blue Rocks (5-2) took advantage of eight walks surrendered by the Winston-Salem pitching staff and two errors from the Dash defense. Meanwhile, the Wilmington bullpen delivered 5.2 shutout innings to secure the victory. The Blue Rocks scored early against Dash starter Zach Lewis (1-1). After a leadoff double by Kyle Isbel in the first inning, Wilmington plated two runs in the opening frame, helped in large part by a passed ball and four walks. Winston-Salem struck back in the top of the second. Catcher Daniel Gonzalez began the rally with a two-out single, and Jordan Georgekept the line moving with a line drive single to left. Then, with runners on first and second, Wilmington starter Daniel Lynch encountered some control issues of his own. Back-to-back walks to Johan Cruz and Zach Remillard allowed the Dash to cut the Blue Rocks lead in half. However, the Blue Rocks padded their lead in the bottom of the third. With one out in the inning, MJ Melendez belted a double to center to bring home Nick Pratto. After Lewis walked Dennicher Carrasco, Jake Elliott came on in relief. While Sebastian Rivero popped out, Wilmington advanced both runners on a double steal. Then, a wild pitch by Elliot gave the Blue Rocks their fourth run of the ballgame. After the wild pitch, Elliott cruised. The right-hander struck out three and walked two across 3.2 hitless innings. Jose Nin rounded out the day for the Dash, allowing just one hit while striking out two in two scoreless frames. While the Dash bullpen delivered a strong effort, Winston-Salem's offense was silenced by the Wilmington bullpen. Coming in relief of Lynch, Robert Garcia (1-0) earned the win, firing 2.2 scoreless innings of one-hit ball with three strikeouts and a walk. After Garcia departed, Collin Snider and Tyler Zuber combined to hold the Dash hitless in the final three innings of the ballgame. The Wilmington pitching staff combined to rack up 11 strikeouts on the day. Winston-Salem will return home to BB&T Ballpark for the home opener tomorrow night as the club hosts the Potomac Nationals. Left-hander John Parke (1-0, 1.80 ERA) will take the hill for the Dash. Parke will square off against fellow lefty Grant Borne (0-0, 4.50 ERA) for Potomac. First pitch is set for 7 p.m., and fans can catch all the action on the Sports Hub Triad, wsdash.com/broadcast and the TuneIn Radio app. Pregame coverage begins at 6:45 p.m. The Dash kick off their 10th anniversary season at BB&T Ballpark on Thursday against the Potomac Nationals. Thursday's home opener will be a Thirsty Thursday, presented by Lowes Foods, and a Pups in the Park outing, presented by Handy and Handy Orthodontics. Following Friday's game, there will be a postgame fireworks display, presented by PTI. A Food Truck Festival and a Chick-fil-A Four Pack Night are on deck for Saturday, while a Rayados Day (presented by Univision) and a Craft Fair are on tap for Sunday. For tickets and more information, call the Dash at (336) 714-2287 or visit wsdash.com.